Xian (Chinese: 仙/仚/僊; pinyin: xiān; Wade-Giles: hsien) is a Chinese word for an enlightened person or “immortal." References to the term “xian” appeared in Chinese texts as early as the third century B.C.E., and its meaning appears to have evolved over the centuries.Early Zhuangzi, Chuci, and Liezi Taoist texts (third – second centuries B.C.E.) used xian immortals and magic islands allegorically to describe spiritual immortality. Later Taoist texts developed an elaborate hierarchy of physically immortal beings with supernatural powers such as the ability to fly. The term “xian” is used in a philosophical context to refer to a sage or someone who has achieved enlightenment or spiritual transcendence; in Chinese alchemy to refer to one who practices physical longevity techniques; in the Taoist pantheon to refer to a celestial being or saint; in folklore to refer to a hermit or a sage who lives in the mountains; in Chinese literature to refer to a genie, nymph or fairy; and as a metaphor for an extraordinarily accomplished person. Semantically, Xian evolved from meaning spiritual "immortality; enlightenment," to physical "immortality; longevity" attained through practices such as alchemy, breath meditation, and Tai chi chuan, and eventually to legendary and figurative "immortality." Some scholars of Taoism allege that later practitioners of esoteric magic and alchemy adopted earlier Taoist texts containing references to allegorical “immortals” as scriptural authority to justify their own concepts of physical immortality. The Eight Immortals (Chinese: 八仙; pinyin: Bāxiān; Wade-Giles: Pa-hsien) are a group of legendary xian in Chinese mythology, first described in the Yuan Dynasty. 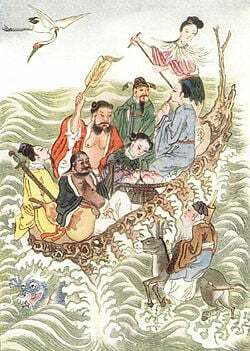 "The Eight Immortals Crossing the Sea," from Myths and Legends of China, 1922, E.T.C. Werner. The most famous Chinese compound of xiān is Bāxiān (八仙; "the Eight Immortals"). Other common words include xiānrén (仙人; sennin in Japanese, "immortal person; transcendent," see Xiānrén Dòng), xiānrénzhăng (仙人掌; "immortal's palm; cactus"), xiānnǚ (仙女; "immortal woman; female celestial; angel"), and shénxiān (神仙; "gods and immortals; divine immortal"). The possible linguistic etymology of xian is Sino-Tibetan "shaman;" and the possible etymology of the character 仙 is "ascend" or "mountain." Axel Schuessler's etymological dictionary (2007, 527) suggests a Sino-Tibetan connection between xiān (Old Chinese *san or *sen):"'An immortal' … men and women who attain supernatural abilities; after death they become immortals and deities who can fly through the air;" and Tibetan gšen (g-syen): "shaman, one who has supernatural abilities, incl[uding] travel through the air." The Shiming (circa 200 C.E. ), the first Chinese dictionary of etymology, defines xiān (仙) as "to get old and not die," and etymologizes it as someone who qiān (遷; "moves into") the mountains." The word xiān is written with three characters: 僊, 仙, or 仚, which combine the logographic "radical" rén (人 or 亻 "person; human") with two "phonetic" elements (see Chinese character). The oldest recorded xiān character 僊 has a xiān ("rise up; ascend") phonetic, supposedly because immortals could "ascend into the heavens." (Compare qiān; 遷"; move; transfer; change" combining this phonetic and the motion radical.) The usual modern xiān character 仙, and its rare variant 仚, have a shān (山 "mountain") phonetic. Kristofer Schipper analyzes the character as meaning "'the human being of the mountain,' or alternatively, 'human mountain.' The two explanations are appropriate to these beings: they haunt the holy mountains, while also embodying nature." The Shijing (220/3) contains the oldest occurrence of the character 僊, reduplicated as xiānxiān (僊僊, "dance lightly; hop about; jump around"), and rhymed with qiān (遷): "But when they have drunk too much, Their deportment becomes light and frivolous – They leave their seats, and [遷] go elsewhere, They keep [僊僊] dancing and capering." The Shuowen Jiezi (121 C.E. ), the first important dictionary of Chinese characters, does not contain 仙 except in the definition for 偓佺 (Wo Quan "name of an ancient immortal"). It defines 僊 as "live long and move away" and 仚 as "appearance of a person on a mountaintop." According to the Digital Dictionary of Buddhism, Chinese xian (仙) can mean Sanskrit ṛṣi (rishi "inspired sage in the Vedas"). Early Zhuangzi, Chuci, and Liezi texts used xian immortals and magic islands allegorically to describe spiritual immortality. Later texts like the Shenxian zhuan and Baopuzi took immortality literally and described esoteric Chinese alchemical techniques believed to increase physical longevity. Neidan (內丹; "internal alchemy") techniques included taixi (胎息; "embryo respiration") breath control, meditation, visualization, sexual training, and Tao Yin exercises (which later evolved into Qigong and Tai Chi Chuan). Waidan (外丹; "external achemy") techniques for attaining immortality included alchemical recipes, magic plants, rare minerals, herbal medicines, drugs, and dietetic techniques like inedia. The earliest artistic representations of Chinese immortals, dating from the Han Dynasty, portray them flying with feathery wings (the word yuren (羽人; "feathered person") later meant "Daoist") or riding dragons. In Chinese art, xian are often pictured with symbols of immortality including the dragon, crane, fox, white deer, pine tree, peach, and mushroom. 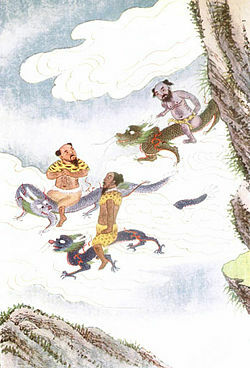 Xian riding dragons, from Myths and Legends of China, 1922, E.T.C. Werner. Besides the following major Chinese texts, many others contain the graphic variants of xian. Xian (仙) occurs in the Chunqiu Fanlu, Fengsu Tongyi, Qian fu lun, Fayan, and Shenjian; xian (僊) occurs in the Caizhong langji, Fengsu Tongyi, Guanzi, and Shenjian. Big Concealment said, "If you confuse the constant strands of Heaven and violate the true form of things, then Dark Heaven will reach no fulfillment. Instead, the beasts will scatter from their herds, the birds will cry all night, disaster will come to the grass and trees, misfortune will reach even to the insects. Ah, this is the fault of men who 'govern'!" "Then what should I do?" said Cloud Chief. "Ah," said Big Concealment, "you are too far gone! (僊僊) Up, up, stir yourself and be off!" Cloud Chief said, "Heavenly Master, it has been hard indeed for me to meet with you—I beg one word of instruction!" "Well, then—mind‑nourishment!" said Big Concealment. "You have only to rest in inaction and things will transform themselves. Smash your form and body, spit out hearing and eyesight, forget you are a thing among other things, and you may join in great unity with the deep and boundless. Undo the mind, slough off spirit, be blank and soulless, and the ten thousand things one by one will return to the root—return to the root and not know why. Dark and undifferentiated chaos—to the end of life none will depart from it. But if you try to know it, you have already departed from it. Do not ask what its name is, do not try to observe its form. Things will live naturally end of themselves." Lieh Tzu could ride the wind and go soaring around with cool and breezy skill, but after fifteen days he came back to earth. As far as the search for good fortune went, he didn't fret and worry. He escaped the trouble of walking, but he still had to depend on something to get around. If he had only mounted on the truth of Heaven and Earth, ridden the changes of the six breaths, and thus wandered through the boundless, then what would he have had to depend on? Therefore I say, the Perfect Man has no self; the Holy Man has no merit; the Sage has no fame. The Chuci (楚辭; "Lyrics of Chu"), an anthology of poems dating from the third-second century B.C.E. contains xian (仙) once and xian (僊) twice, reflecting the disparate origins of the text. These three contexts mention the legendary Daoist xian immortals Chi Song (赤松; "Red Pine"  and Wang Qiao (王僑, or Zi Qiao; 子僑). In later Taoist hagiography, Chi Song was Lord of Rain under Shennong, the legendary inventor of agriculture; and Wang Qiao was a son of King Ling of Zhou (r. 571-545 B.C.E. ), who flew away on a giant white bird, became an immortal and was never seen again. And my body, left tenantless, grew withered and lifeless. And sought to learn from where the primal spirit issues. And those of past ages who had become [仙] Immortals. Leaving a famous name that endures after them. As we rested on the whirlwind, drifting about at random. There, with the other blessed ones, were Red Pine and Wang Qiao. I sang the Qing Shang air to their playing. Gently I floated, inhaling all the essences. Was not worth the sacrifice of my home-returning. Sadly I gaze in the distance, over the empty plain. Above, I seek out [僊] holy hermits. The White Tiger runs back and forth in attendance. Riding on the white deer we sport and take our pleasure. . The "Li Sao" (離騷; "On Encountering Trouble"), the most famous Chuci poem, is usually interpreted as describing ecstatic flights and trance techniques of Chinese shamans. The three poems quoted above are variations describing Daoist xian. Ate of the Primal Essence to prolong my life. The Liezi (列子; "[Book of] Master Lie"), which according to Louis Komjathy "was probably compiled in the third century C.E. (while containing earlier textual layers)," uses xian four times, always in the compound xiansheng (仙聖 "immortal sage"). Chapter 5 uses xiansheng three times in a conversation set between legendary rulers Tang (湯) of the Shang Dynasty and Ji (革) of the Xia Dynasty. —'To the East of the Gulf of Chih-li, who knows how many thousands and millions of miles, there is a deep ravine, a valley truly without bottom; and its bottomless underneath is named "The Entry to the Void." The waters of the eight corners and the nine regions, the stream of the Milky Way, all pour into it, but it neither shrinks nor grows. Within it there are five mountains, called Tai-yü, Yüan-chiao, Fang-hu, Ying-chou and P'eng-Iai. These mountains are thirty thousand miles high, and as many miles round; the tablelands on their summits extend for nine thousand miles. It is seventy thousand miles from one mountain to the next, but they are considered close neighbours. The towers and terraces upon them are all gold and jade, the beasts and birds are all unsullied white; trees of pearl and garnet always grow densely, flowering and bearing fruit which is always luscious, and those who eat of it never grow old and die. The men who dwell there are all of the race of (仙聖) immortal sages, who fly, too many to be counted, to and from one mountain to another in a day and a night. Yet the bases of the five mountains used to rest on nothing; they were always rising and falling, going and returning, with the ebb and flow of the tide, and never for a moment stood firm. The (仙聖) immortals found this troublesome, and complained about it to God. God was afraid that they would drift to the far West and he would lose the home of his sages. So he commanded Yü-ch'iang to make fifteen giant turtles carry the five mountains on their lifted heads, taking turns in three watches, each sixty thousand years long; and for the first time the mountains stood firm and did not move. Penglai Mountain became the most famous of these five mythical peaks where the elixir of life supposedly grew, and is known as Horai in Japanese legends. The first emperor Qin Shi Huang sent his court alchemist Xu Fu on expeditions to find these plants of immortality, but he never returned (although by some accounts, he discovered Japan). The Shenxian zhuan (神仙傳; Biographies of Spirit Immortals) is a hagiography of xian. Although it was traditionally attributed to Ge Hong (283-343 C.E. ), most the approximately 100 hagiographies contained in the text date from 6th-8th centuries at the earliest. "...blow on water and it will flow against its own current for several paces; blow on fire, and it will be extinguished; blow at tigers or wolves, and they will crouch down and not be able to move; blow at serpents, and they will coil up and be unable to flee. If someone is wounded by a weapon, blow on the wound, and the bleeding will stop. If you hear of someone who has suffered a poisonous insect bite, even if you are not in his presence, you can, from a distance, blow and say in incantation over your own hand (males on the left hand, females on the right), and the person will at once be healed even if more than a hundred li away. And if you yourself are struck by a sudden illness, you have merely to swallow pneumas in three series of nine, and you will immediately recover. But the most essential thing [among such arts] is fetal breathing. Those who obtain [the technique of] fetal breathing become able to breathe without using their nose or mouth, as if in the womb, and this is the culmination of the way [of pneumatic cultivation]." The hunters took the woman back in. They offered her grain to eat. When she first smelled the stink of grain, she vomited, and only after several days could she tolerate it. After little more than two years of this [diet], her body hair fell out; she turned old and died. Had she not been caught by men, she would have become a transcendent." Dān (丹 - "Alchemy," literally "Cinnabar") – Elixir of Immortality. Tiānxiān (天仙; “Celestial Immortal”): The highest level. Dìxiān (地仙; “Earth Immortal”): The middle level. Shījiě xiān (尸解仙; "Escaped-by-means-of-a-stimulated-corpse-simulacrum Immortal," literally "Corpse Untie Immortal"): The lowest level. This is considered the lowest form of immortality since a person must first “fake” his own death by substituting a bewitched object like a bamboo pole, sword, talisman or a shoe for his corpse or slipping a type of death certificate into the coffin of a newly departed paternal grandfather, thus having their name and "allotted life span" deleted from the ledgers kept by the Sīmìng (司命; "Director of Allotted Life Spans," literally "Controller of Fate"). Hagiographies and folktales abound of people who seemingly die in one province, but are seen alive in another. Mortals who choose this route must cut off all ties with family and friends, move to a distant province, and enact the Ling bao tai xuan yin sheng zhi fu (靈寳太玄隂生之符 ; Numinous Treasure Talisman of the Grand Mystery for Living in Hiding) to protect themselves from heavenly retribution. Dìxià zhǔ (地下主; “Agents Beneath the Earth”) are in charge of keeping the peace within the Chinese underworld. They are eligible for promotion to earthbound immortality after 280 years of faithful service. Dìshàng zhǔzhě (地上主者; "Agents Above the Earth") are given magic talismans which prolong their lives (but not indefinitely) and allow them to heal the sick and exorcize demons and evil spirits from the earth. This level was not eligible for promotion to earthbound immortality. Zhìdì jūn (制地君; "Lords Who Control the Earth") - A heavenly decree ordered them to "disperse all subordinate junior demons, whether high or low [in rank], that have cause afflictions and injury owing to blows or offenses against the Motion of the Year, the Original Destiny, Great Year, the Kings of the Soil or the establishing or breaking influences of the chronograms of the tome. Annihilate them all." This level was also not eligible for promotion to immortality. The Zhong Lü Chuan Dao Ji (鐘呂傳道集/钟吕传道集; Anthology of the Transmission of the Dao from Zhong[li Quan] to Lü [Dongbin]) is associated with Zhongli Quan (second century C.E.?) and Lü Dongbin (ninth century C.E. ), two of the legendary Eight Immortals. It is part of the so-called “Zhong-Lü” (鍾呂) textual tradition of internal alchemy (neidan). The text, which probably dates from the late Tang (618-906) dynasty, is in question-and-answer format, containing a dialogue between Lü and his teacher Zhongli on aspects of alchemical terminology and methods. Rénxiān (人仙; “Human Immortal”): Humans have an equal balance of yin and yang energies, so they have the potential of becoming either a ghost or immortal. Although they continue to hunger and thirst and require clothing and shelter like a normal human, these immortals do not suffer from aging or sickness. Human immortals do not leave the realm of humans. There are many sub-classes of human immortals. Tiānxiān (天仙 – “Celestial Immortal”) – Spirit immortals who are summoned to heaven are given the minor office of water realm judge. Over time, they are promoted to oversee the earth realm and finally become administrators of the celestial realm. These immortals have the power to travel back and forth between the earthly and celestial realms. Over the centuries, the term "xian" came to refer to beings with supernatural powers, but some scholars believe that the early Taoist "xian" referred to a person who was one with the Tao. Sinologist Holmes Welch identified the origins of Taoism, sometime around the fourth-third centuries B.C.E., as four separate streams: philosophical Taoism (Laozi, Zhuangzi, Liezi), a "hygiene school" that cultivated longevity through breathing exercises and yoga, Chinese alchemy and Five Elements philosophy, and those who sought Penglai and elixirs of "immortality." He concluded that though the early Taoists Zhuangzi and Liezi used the word “Immortal” ("xian") they did not believe in or condone the possibility of a supernatural existence. The magical powers they spoke of were intended to be allegories and hyperboles for the "natural" powers that come from identification with Tao, and the images in early texts of Spiritualized Man and Mount Penglai were meant to entertain and evoke reflection, not to be taken literally. Their texts were later adopted as scriptural authority by practitioners of magic and those who sought to become immortal. According to Dr. Victor H. Mair, a specialist in early Chinese vernacular, xian as described in Chinese texts were impervious to heat or cold, unaffected by the elements, and possessed the ability to fly. They lived on air and dew, and had smooth skin and innocent faces like children. They dwelt in a realm apart from the chaotic human world and did not suffer from anxiety or uncertainty. ↑ translation by James Legge Retrieved January 20, 2009. ↑ Daoist Texts in Translation. Louis Komjathy, 2004. ↑ 21.0 21.1 21.2 21.3 21.4 Eva Wong. The Tao of Health, Longevity, and Immortality: The Teachings of Immortals Chung and Lü. (Boston: Shambhala. 2000). ↑ “It is my own opinion, therefore, that though the word hsien, or Immortal, is used by Chuang Tzu and Lieh Tzu, and though they attributed to their idealized individual the magic powers that were attributed to the hsien in later times, nonetheless the hsien ideal was something they did not believe in—either that it was possible or that it was good. The magic powers are allegories and hyperboles for the natural powers that come from identification with Tao. Spiritualized Man, P'eng-lai, and the rest are features of a genre which is meant to entertain, disturb, and exalt us, not to be taken as literal hagiography. Then and later, the philosophical Taoists were distinguished from all other schools of Taoism by their rejection of the pursuit of immortality. As we shall see, their books came to be adopted as scriptural authority by those who did practice magic and seek to become immortal. But it was their misunderstanding of philosophical Taoism that was the reason they adopted it.” Holmes Welch. Taoism: The Parting of the Way. (Boston: Beacon Press. 1957), 95. ↑ "They are immune to heat and cold, untouched by the elements, and can fly, mounting upward with a fluttering motion. They dwell apart from the chaotic world of man, subsist on air and dew, are not anxious like ordinary people, and have the smooth skin and innocent faces of children. The transcendents live an effortless existence that is best described as spontaneous. They recall the ancient Indian ascetics and holy men known as ṛṣi who possessed similar traits." Victor H. Mair, Wandering on the Way: early Taoist tales and parables of Chuang Tzu. (New York: Bantam. 1994), 376. DeWoskin, Kenneth. "Xian Descended: Narrating Xian among Mortals." Taoist Resources 1990. 1(2): 21-27. Fox, Alan. Zhuangzi, in Great Thinkers of the Eastern World, Ian P. McGreal ed., HarperCollins Publishers, 1995, 99-103. Retrieved January 20, 2009. Komjathy, Louis. 2004. Daoist Texts in Translation. Retrieved January 20, 2009. Robinet, Isabel. "The Taoist Immortal: Jesters of Light and Shadow, Heaven and Earth" Journal of Chinese Religions 1986. 13/14:87-106. Retrieved January 20, 2009. Wong, Eva. The Tao of Health, Longevity, and Immortality: The Teachings of Immortals Chung and Lü. Boston: Shambhala. 2000. History of "Xian (Daoist immortal)"
This page was last modified on 1 August 2013, at 14:20.